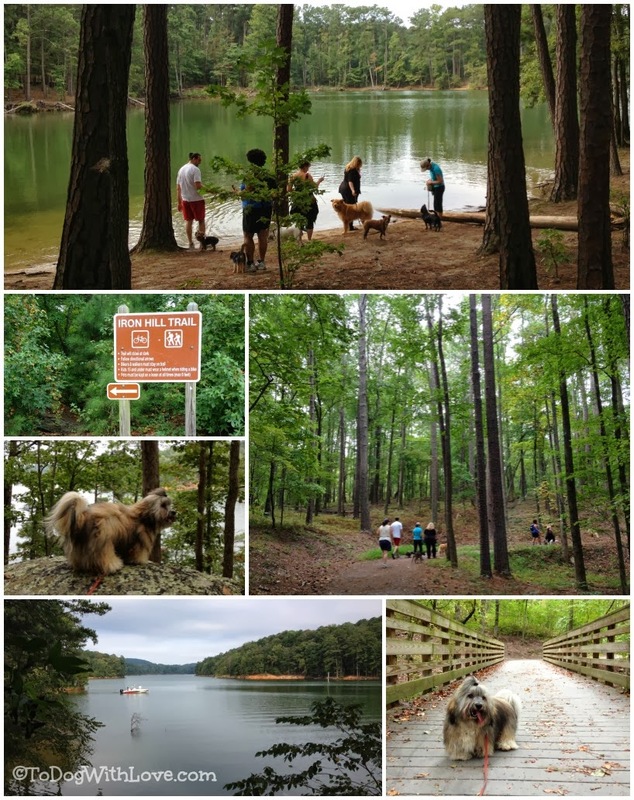 Last weekend we joined up with one of our favorite dog hiking Meetup groups for a hike at Red Top Mountain State Park in Cartersville, Ga. One of the fun things about Meetup groups is discovering places we haven't been before. And while I've been to Red Top Mountain, I didn't know about the Iron Hill Bike/Hike trail, the 3.9 mile trail we tackled with our Meetup group last weekend. Red Top Mountain was once an important mining area for iron, and this trail is named for the soil's rich red color caused by high iron-ore content. One of the nice things about this trail it winds along the banks of Lake Allatoona, and there's a nice spot where dogs can swim. However the park rules say that pets should be kept on a leash at all times with a maximum leash length of six feet. So the dogs in our group waded in, but there wasn't a whole lot of swimming. We decided to explore these first since they seemed most scenic. 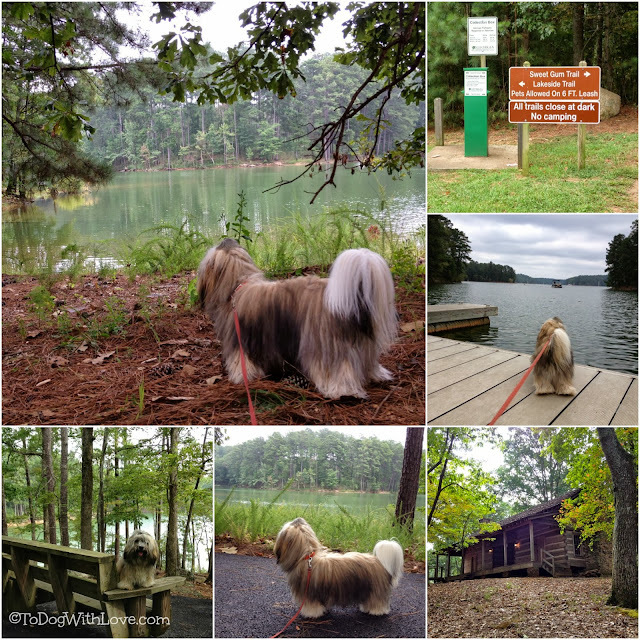 First we explored the paved Lakeside trail, above, which included the 1869 homestead, benches along the banks and a dock with a lovely view of the lake. Then, we headed to the White Tail trail -- named after Rocco's white tail... or maybe not! 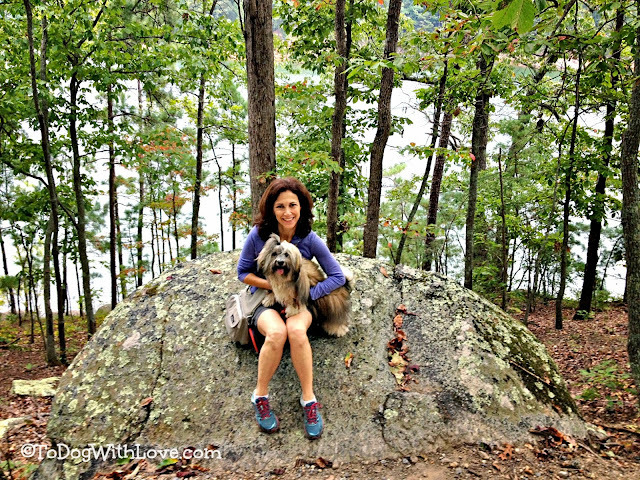 This is the trail that winds up at a scenic point overlooking the 12,000 acre Lake Allatoona. Rocco and I enjoyed the view from the rocks. We'll have to go back another day to check out the three other trails that range from .75 miles to 5.5 miles in length. This week we will be randomly selecting one of the commenters from the FitDog Friday blog hosts: SlimDoggy, Peggy’s Pet Place and To Dog With Love. The selected commenter will receive a sample pack of dog treats courtesy of Cloud Star, makers of Dynamo Dog Functional Treats. Make sure to share your FitDog Friday thoughts in the comments below and on our co-hosts blogs and you may win a great prize for your fit dog! Wow! 12k acre. Sounds like you had a super fun time! It's a great park! I hadn't been there in a while and forgot how nice it is! I can't believe that Rocco has a trail named after him! How cool. Looks like great trails - and some great exercise. I know! 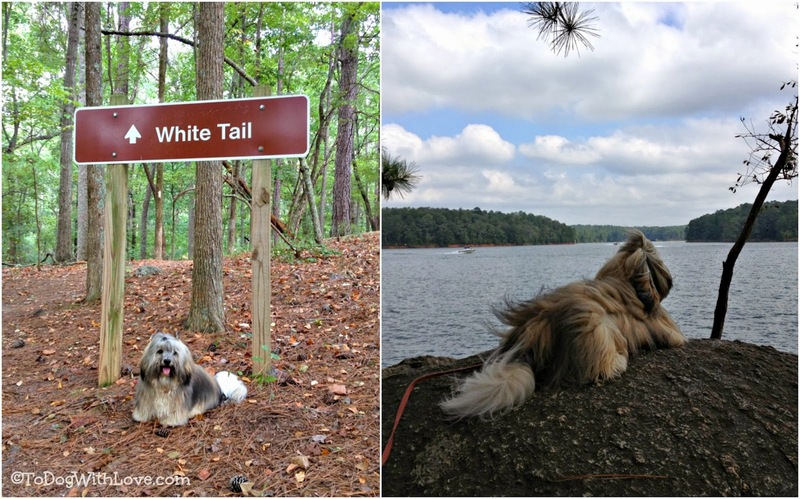 We had to do the White Tail Trail! I had never walked that one before either. 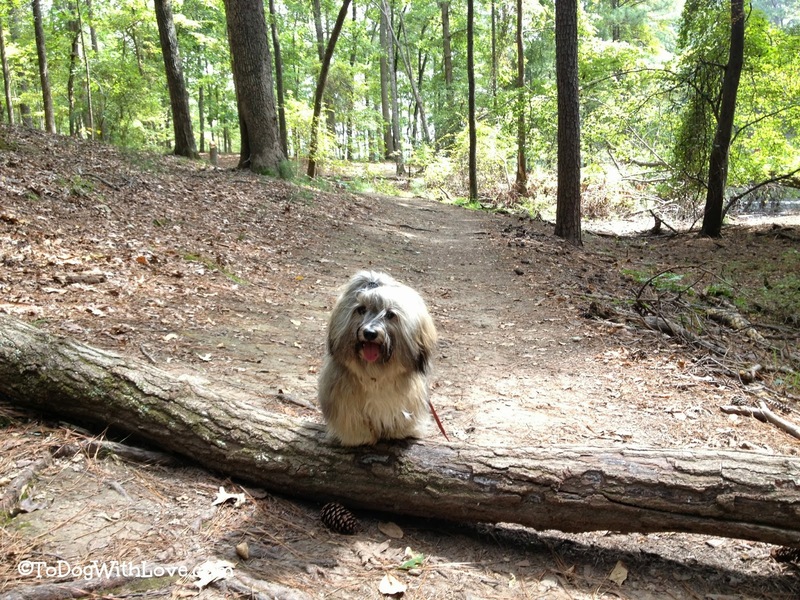 I've only walked some of the main trails -- the other one's not mentioned in this post. Cool park. Did it tire Rocco out? Ha! Rocco does NOT tire out! At least I haven't seen it yet! Looks like a nice wooded area to hike. I like that there was a swimming spot, but you did not mention if there were lots of squirrels and wabbits to watch and chase. I bet there were with all the woods. Hiking/walking somewhere new is always so much fun. oh yeah! There were lot's of critters to chase! Rocco and I did a lot of sprinting since I did want to keep him leashed, and it's required! Ha! That's funny! It is hard to tell which end is which... especially when he's sleeping! That looks like such a wonderful park, with so many different trails and bodies of water, and scenery to enjoy. With varied terrain and distances it seems like there's something for everyone. How nice that you have dog meetup groups too, that's something we should do around here. som sin hjälp mig . Stor jobb . If you would like to try home remedies to repel fleas and ticks, try feeding your pooch garlic each day. It is a time-honored remedy, and also provides nutrients for your furry friend at the same time.